en suite facilities include a double shower. 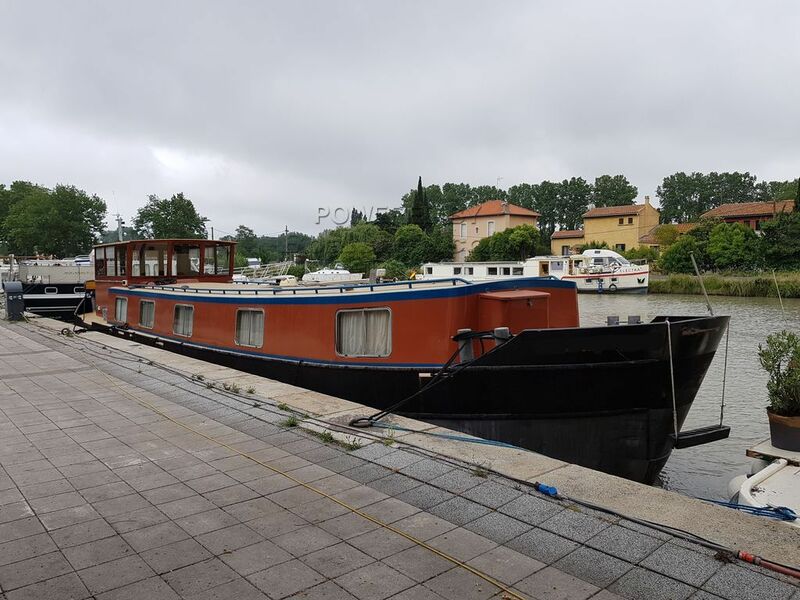 Boatshed Midi Canals are pleased to offer this Peter Nicholls 18 metre barge for sale in the south of France. Perfect for a couple or family who wish to live aboard in luxury and travel the waterways of France and the rest of Europe. This is a high specification, custom built one owner vessel. Not only designed for comfort but very practicle as there is easy access to all mechanical, electrical and plumbing areas. Everywhere immaculate and panelled in Brazilian Utile. Specifically designed for a couple with occasional guests but easy enough to convert the bureau into a second cabin. For more information or organise a visit, contact, Graham WHARMBY, your local broker at Boatshed Midi Canals. This Replica Dutch Barge 58 CAT.C has been personally photographed and viewed by James Hebden of Boatshed Midi Canals. Click here for contact details.